Each month, Nonna Box features a five to seven of traditional, imported and hard-to-come-by Italian products. 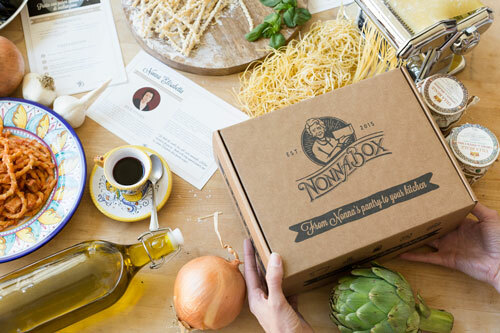 Nonna Box brings people closer to Italy via its flavors, gastronomical history, and the monthly story of an Italian nonna along with her favorite traditional recipe and wine pairings from an Italian sommelier. It is the perfect gift for the holidays! ALL ORDERS BEFORE THE 19TH OF DECEMBER WILL BE DELIVERED BEFORE CHRISTMAS! Awesome product and gift! I ordered for my nonna and she loved it! Perfect gift. Products were top quality, we found ingredients that we didn’t know existed and learned new traditional recipes. This is my third time I choose to gift a Nonna Box. So far it has been absolutely loved!